On November 27, 603, the 20-year reign of Byzantine Emperor Maurice came to a most violent conclusion when he was forced to watch his five sons beheaded, and was then executed himself. 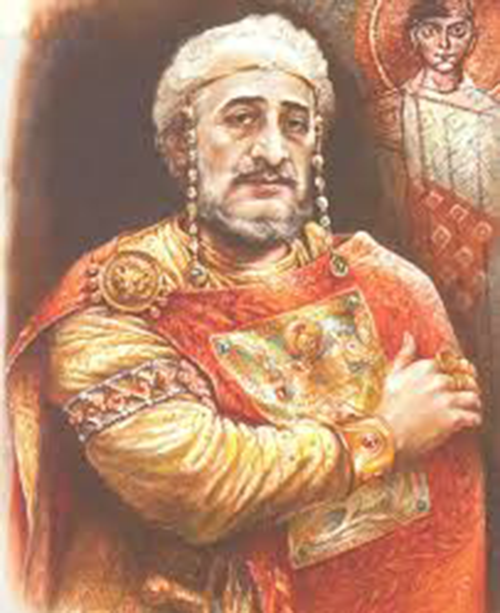 Maurice’s road to the throne began when he was serving as a general in a never-ending war against the Persian Sassanids. He brought them to heel in 581, and Emperor Tiberius II was so impressed that he OKed a marriage with his daughter Constantina, and named Maurice as his successor. When his father-in-law died in August 582, Maurice was left with an empire that was bankrupt and in complete chaos. He got right to work, managing to bring lasting peace with Persia and expanding his empire’s borders at the same time. He even saved the treasury a bundle in money that was being spent on tributes. Then Maurice turned his attention to the Balkans, where the Slavs had been messing with the Byzantine provinces for years, knowing they were too busy fighting the Persians to retaliate. But starting in 592, Maurice began campaigning in the area. Over the course of a decade, he had won so many decisive victories that he was planning to resettle decimated areas with Armenians. Maurice’s tireless efforts brought slow and steady success. The peace he brokered with Persia proved to be especially beneficial to the empire, and was the cause of his initial popularity early in his reign. However, as the years passed, the people turned against him, mostly due to his fiscal decisions. The troops in Persia rioted when Maurice announced their pay was being cut by 25 percent in 588. He made matters much worse the following year when he refused to pay a small ransom for about 12,000 of his soldiers taken prisoner by the Avars in the Balkans. All of the prisoners were killed. A military delegation led by a man named Phocas that traveled to Constantinople to protest was rebuffed and humiliated. With each new insult, intended or not, public outrage against the Emperor grew exponentially. Maurice was thinking only in terms of dollars and cents once again when he decided his troops should winter beyond the Danube to save a buck. The fed-up troops mutinied. Completely misjudging the situation, the Emperor ordered a new offensive. The troops responded by naming Phocas as their new leader, and demanded that Maurice abdicate. Constantinople broke out in riots, and Maurice and his family left the city for Nicomedia. Phocas came to Constantinople in November. While he was being crowned as emperor, his toadies were out hunting down the ex-emperor and his family. When they were found, the old man was forced to watch as all his sons were beheaded one by one until it was his turn. Maurice’s wife and three daughters were spared – at least for a while. A few years later, they were all executed as well for “living”, no, wait – “plotting”. As for Phocas, in 610, he was beheaded on the order of Heraclius, who usurped the throne from him. It’s good to be the “king”?